As then the Rocks it now draws on the Stars. From its ownership by these divinities came various adjectival titles: Ἑρμαίη and Κυλλεναίη, referring to Hermes and his birthplace; Cicero'sClara Fides Cyllenea and Mercurialis, that Varro also used;a and the Cithara, or Lyra, Apollinis, Orphei, Orphica, and Mercurii. It also wasLyra Arionis and Amphionis, from those skilful players; but usually it was plain Lyra and, later on, Cithara; Fides, — the Fidis of Columella, who, with Pliny, also used Fidicula; Decachordum; and Tympanum. In this same connection we see Fidicen, the Lyrist; Deferens Psalterium; and Canticum, a Song. The occasional early title Aquilaris was from the fact that the instrument was often shown hanging from the claws of the Eagle also imagined in its stars. In Greece it was Κιθάρα; the ancient Φόρμιγξ, the first stringed instrument of the Greek bards; and Λύρα or Λύρη, and Λύρα κατοφερής, the Pendent Lyre. From earth unto the fixéd stars. Still it has been shown with but six, and a vacant space for the seventh, which Spence, in the Polymetis, referred to the Lost Pleiad. Manilius seems to have made two distinct constellations of this, — Lyra and Fides, — although we do not know their boundaries, and the subject is somewhat confused in his allusions to it. The Persian Hafiz called it the Lyre of Zurah, and his countrymen translated Κιθάρα by Ṣanj Rūmi; the Arabians turning this into Al Ṣanj, from which Hyde and others derived Asange, Asenger, Asanges, Asangue, Sangue, and Mesanguo, all titles for Lyra in Europe centuries ago. But Assemani thought that these were from Schickard's Azzango, a Cymbal. The reproduced p282Alfonsine Tables of 1863‑67 give Alsanja; while Ṣanj was again turned into Arnig and Aznig in the translation of Reduan's Commentary, and into the still more unlikely Brinek, as has been explained by Ideler. In Bohemia our Lyre was Hauslicky na Nebi, the Fiddle in the Sky; but the Teutons knew it as Harapha, and the Anglo-Saxons as Hearpe, which Fortunatus of the 6th century, the poet-bishop of Poitiers, called the barbarians' Harpa. With the early Britons it was Talyn Arthur, that hero's Harp. Novidius said that it was King David's Harp; but Julius Schiller, that it was the Manger of the Infant Saviour, Praesepe Salvatoris. Jugum has been wrongly applied to it, from the Ζυγόν of Homer, but this was for the Yoke, or Cross-bar, of the instrument, with no reference to the constellation, which Homer probably did not know; still the equivalent Ζύγωμα was in frequent use for it by Hipparchos. Sundry other fancied figures have been current for these stars. Acosta mentioned them as Urcuchillay, the parti-colored Ram in charge of the heavenly flocks of the ancient Peruvians; Albegala and Albegalooccur with Bayer and Riccioli, like the Arabic Al Baghl, a Mule, although their appropriateness is not obvious; and Naṣrº al Dīn wrote of α, ε, andζ collectively as Dik Paye among the common people of Persia; this was the Χυτρό-πους, or Greek tripod, and the Uthfiyyah of the nomad Arabs. Chirka, also attributed to Naṣr al Dīn, was, by some scribe's error for Ḣazaf, figured in this location on the Dresden globe as a circular vessel with a flat bottom and two handles; but on the Borgian it is a Scroll, commonly known, according to Assemani, as Rabesco. The association of Lyra's stars with a bird perhaps originated from a conception of the figure current for millenniums in ancient India, — that of an Eagle or Vulture; and, in Akkadia, of the great storm-bird Urakhga before this was there identified with Corvus. But the Arabs' title, Al Naṣr al Wāḳiʽ,1a — Chilmead's Alvaka, — referring to the swooping Stone Eagle of the Desert, generally has been attributed to the configuration of the group α, ε, ζ, which shows the bird with half-closed wings, in contrast to Al Naṣr al Ṭā᾽ir,1b the Flying Eagle, our Aquila, whose smaller stars, β and γ, on either side of α, indicate the outspread wings. Scaliger cited the synonymous Al Naṣr al Sākiṭ, from which came theNessrusakat of Bayer and Nessrusakito of Assemani. Al Sufi, alone of extant Arabian authors, called it Al Iwazz, the Goose. Chrysococca wrote of it as Γυψ καθήμενος, the Sitting Vulture, and it has been Aquila marina, the Osprey, and Falco sylvestris, the Wood Falcon.p283Its common title two centuries ago was Aquila cadens, or Vultur cadens, the Swooping Vulture, popularly translated the Falling Grype, and figured with upturned head bearing a lyre in its beak. Bartsch's map has the outline of a lyre on the front of an eagle or vulture. As empty as the last new sonnet. In shape, material and dimension! the poet doubtless having in mind the current story that the Tortoise-Lyre was placed in the sky near Hercules for the alleviation of his toil. The Alfonsine illustration is of a Turtle, Galapago in the original Spanish, which Caesius turned into the indefinite Belua aquatica, and La Lande intoMus and Musculus, some marine creature, not the little rodent. Other names were Testa, the creature's Upper Shell; and Pupilla, which, by a roundabout process of continued blundering explained by Ideler, was derived from Testa, or, as seems more likely, from Aquila. Bayer's Βάσανος is probably a mistranslation of Testa that also signified a Test. Smyth said that another Testudo was at one time proposed as a constellation title for some of the outside stars of Cetus, between the latter's tail and the cord of Pisces. When the influence of Greek astronomy made itself felt in Arabia, many of the foregoing designations, or adaptations thereof, became current; among them Nablon, from Νάβλα, or Nablium, the Phoenician Harp; Al Lurā, which degenerated into Allore, Alloure, Alohore, Alchoro, etc., found p284in the Alfonsine Tables and other bygone lists; Shalyāḳ and Sulaḥfāt, words for the Tortoise, Ulug Beg's translator having the former asShelyāk, which Piazzi repeated in his catalogue; Salibāḳ, which heads Kazwini's chapter on the Lyre; — Ideler tracing these Arabic words toΧέλυς. They were turned into Azulafe and Zuliaca in the original Alfonsine Tables, and Schaliaf in Chilmead's Treatise. The Almagest of 1515 combines all these figures for Lyra's stars in its Allore: et est Vultur cadens: et est Testudo; while that of 1551 says Lyrae Testudo. But, notwithstanding the singularly diverse conceptions as to its character, the name generally has been Lyra, and the figure so shown. Roman coins still in existence bear it thus, as does one from Delos, Apollo's birthplace in the Cyclades; and Cilician money had this same design with the head of Aratos on the obverse. The Leyden Manuscript has the conventional instrument, with side bars of splendid horns issuing from the tortoise-shell base; the Venetian Hyginus of 1488, with a similar figure, calls it Lura as well as Lyra; but the drawing of Hevelius shows "an instrument which neither in ancient nor in modern times ever had existence." Dürer's illustration, as well as others, places it with the base towards the north. 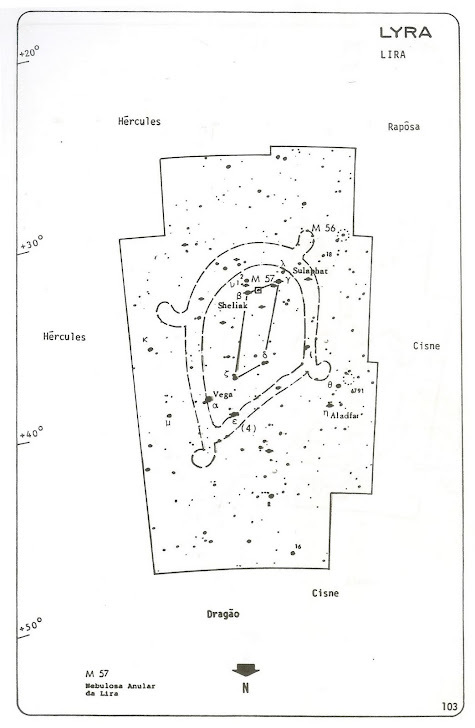 Lyra is on the western edge of the Milky Way, next to Hercules, with the neck of Cygnus on the east, and contains 48 stars according to Argelander, 69 according to Heis. Its location is noted as one of the various regions of concentration of stars with banded spectra, Secchi's 3d type, showing a stage of development probably in advance of that of our sun. From near its κ, 5° southwest of Wega, radiate the swiftly moving Lyraids, the meteors which are at their maximum of appearance on the 19th and 20th of April, but visible in lesser degree from the 5th of that month to the 10th of May. These have been identified as followers of the comet 1 of 1861. Burning with soft blue lustre. Willis' The Scholar of Thebet ben Khorat. Wega, less correctly Vega, originated in the Alfonsine Tables from the Wāḳiʽ of the Arabs, Bayer having both titles; Scaliger, Waghi; Riccioli,Vuega vel Vagieh; and Assemani, Veka. The Greeks called it Λύρα, which, in the 16th‑century Almagests and Tables, was turned into Allore, Alahore, and Alohore. Among Latin writers it was Lyra, in classical days as in later, seen in p285the Almagest of 1551 as Fulgens quae in testa est & vocatur Lyra; and in Flamsteed's Testa fulgida dicta Lyra; but Cicero also used Fidis specially for the star, as did Columella and Pliny [XVIII, passim], Fides and Fidicula, its preëminent brightness fully accounting for the usurpation of so many of its constellation's titles, indeed undoubtedly originating them. In Holland's translation of Pliny it is the Harp-star. The Romans made much of it, for the beginning of their autumn was indicated by its morning setting. It was this star that, when the hour of its rising was alluded to, called forth Cicero's remark, "Yes, if the edict allows it," — a contemptuous reference to Caesar's arbitrary, yet sensible, interference with the course of ancient time in the reformation of the calendar, an interference that occasioned as much dissatisfaction in his day as did Pope Gregory's reform2 in the 16th century. but fourteen millenniums have passed since Wega occupied that position! The Chinese included it with ε and ζ in their Chih Neu, the Spinning Damsel, or the Weaving Sister, at one end of the Magpies' Bridge over the Milky Way, — Aquila, their Cow Herdsman, being at the other; but the story, although a popular one not only in China, but also in Korea and Japan, is told with many variations, parts of Cygnus sometimes being introduced. These same three stars were the 20th nakshatra, Abhijit, Victorious, the most northern of these stellar divisions and far out of the moon's path, but apparently utilized to bring in this splendid object; or, as Mueller says, because it was of specially good omen, for under its influence the gods had vanquished the Asuras; these last being the Hindu divinities of evil, similar to the Titans of Greece. It was the doubtful one of that country's lunar stations, included in some, but omitted in others of their lists in all ages of their astronomy, and entirely different from the corresponding manzil and sieu, which lay in Capricorn. The Hindus figured it as a p286Triangle, or as the three-cornered nut of the aquatic plant Cringata, Wega marking its junction with the adjoining Çravana. Hewitt says that in Egypt it was Maʽat, the Vulture-star, when it marked the pole, — this was 12000 to 11000 B.C. 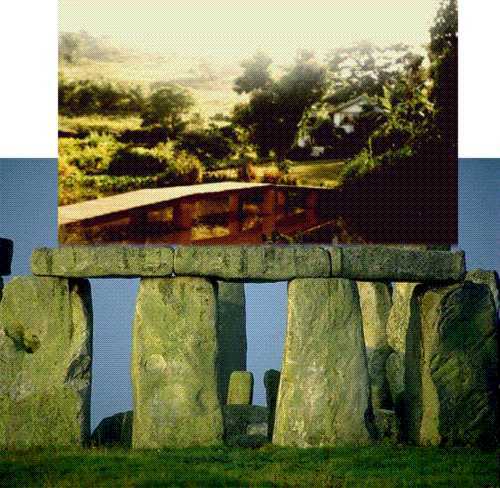 (1), — and Lockyer, that it was the orientation point of some of the temples at Denderah long antecedent to the time when γ Draconis and α Ursae Majoris were so used, — probably 7000 B.C., — one of the oldest dates claimed by him in connection with Egyptian temple worship. Owing to precession, it will be the Polaris of about 11500 years hence, by far the brightest in the whole circle of successive pole-stars, and then 4½ ° from the exact point, as it was about 14300 years ago. In 1880 it was 51°20′ distant. Professor Lewis Boss and Herr Stumpe place near it the Apex of the Sun's Way. Picard failed in his efforts to obtain its parallax in the 17th century, but Struve thought that he had succeeded in this by his observations previous to 1840; still much discrepancy exists in the recent determinations. Elkin, in 1892, gave it as 0ʺ.092; or, to put it in popular language, if the distance from the earth to the sun be regarded as •one foot, that from Wega would be 158 miles. The 10th‑magnitude companion, about 48ʺ away, used for some of these determinations, is entirely independent of it, although difficult to be seen owing to the great brilliancy of Wega. At least two other still fainter companions also have been found. This was the first star submitted to the camera, by the daguerreotype process, at the Harvard Observatory on the 17th of July, 1850. It lies on the western edge of the constellation figure, and, after Sirius, is the most prominent of the stars showing spectra of the Sirian type; yet, with all its splendor, affords but 1/9 of the latter's light. Still it is supposed to be enormously larger than our sun, proportionately very much hotter. It is moving toward our system at the rate of about 9½ miles a second, and makes "the nearest approach in the northern hemisphere to an independently blue star"; while its flashing brilliancy justifies its being called the Arc-light of the sky. Miss Mitchell strangely called it pale yellow. Wega rises at sunset far toward the north on the 1st of May, and, being visible at some hour of every clear night throughout the year, is an easy and favorite object of observation. It culminates on the 12th of August. With ε and ζ it formed one of the Arabs' several Athāfiyy, this one being "of the people," while the others, fainter in Aries, Draco, Musca, and Orion, were "of the astronomers"; for sky objects are often very plain to them that are invisible to the ordinary observer. p287β, Variable and binary, 3.4 to 4.5, very white. Sheliak, Shelyak, and Shiliak are from Al Shilyāk, one of the Arabian names for Lyra. The star lies about 8° southwest from Wega and 2½ ° west from γ. With δ and ι it was Tsan Tae in China. The changes in its brilliancy, detected by Goodricke in 1784, were fully investigated by Argelander from 1840 to 1859, and showed a regularly increasing period of variability which now is 12 days, 21¾ hours, with several fluctuations of a somewhat complex nature. 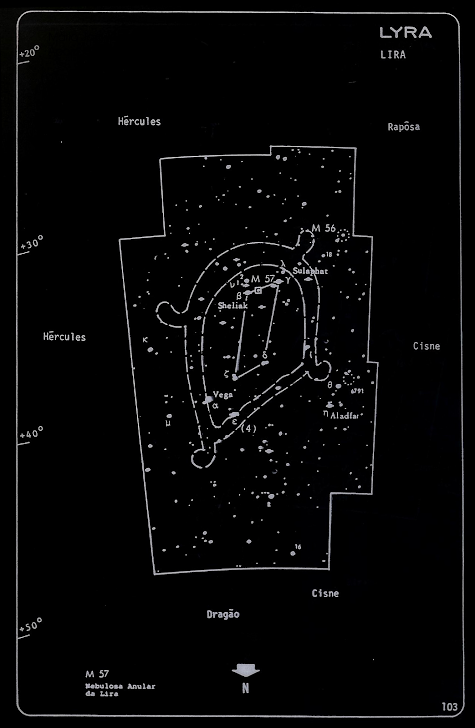 2½ east of β is Sulafat, from another of the titles of the whole constellation. Jugum, formerly seen for it, may have come from a misunderstanding of Bayer's text, where it probably is used merely to designate the star's position on the frame of the Lyre, his words being ad dextrum cornu, Ζυγόν, Iugum, — a fair example of the indefiniteness of much of his stellar nomenclature. 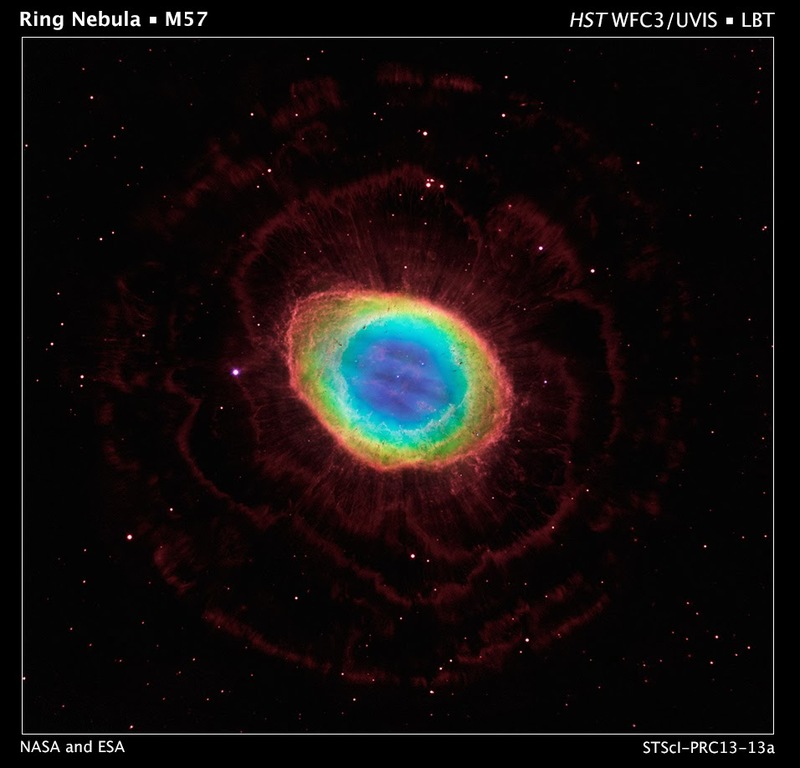 At a distance point ⅓ of the distance from β to γ is the wonderful Ring Nebula, NGC 6720, 57 M., discovered in 1772 by Darquier from Toulouse, although its apparent annular form was not revealed till later by Sir William Herschel's observations. 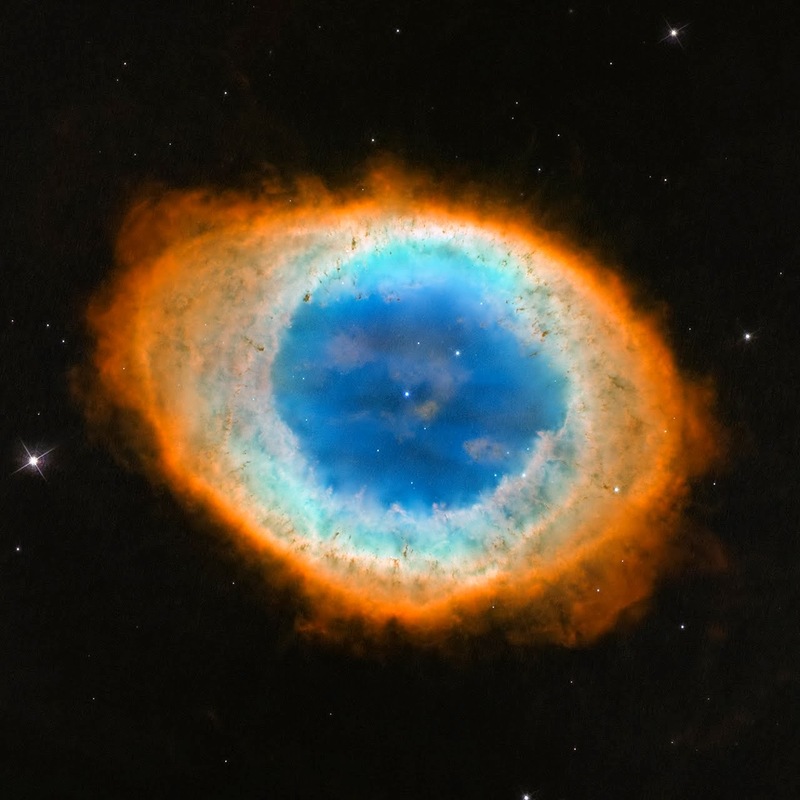 In our day high-powers show its oval form somewhat undefined at the edges, with a dark opening in the centre containing a few very faint stars, among which, visible only in the largest telescopes, but prominent in photographs, is a central condensation of light like a star. 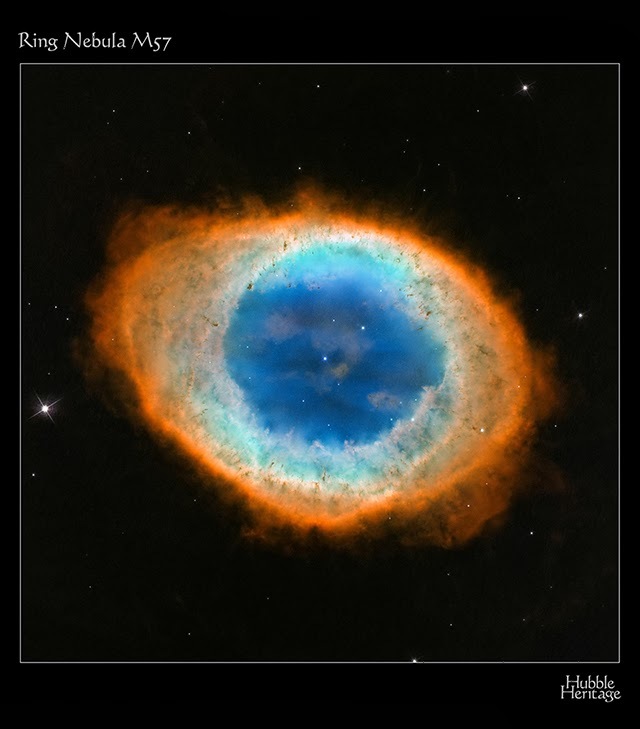 p288The spectrum of nebula and central "star" is purely gaseous. Although appearing oval to us, it is supposed to be nearly circular, but seen obliquely. 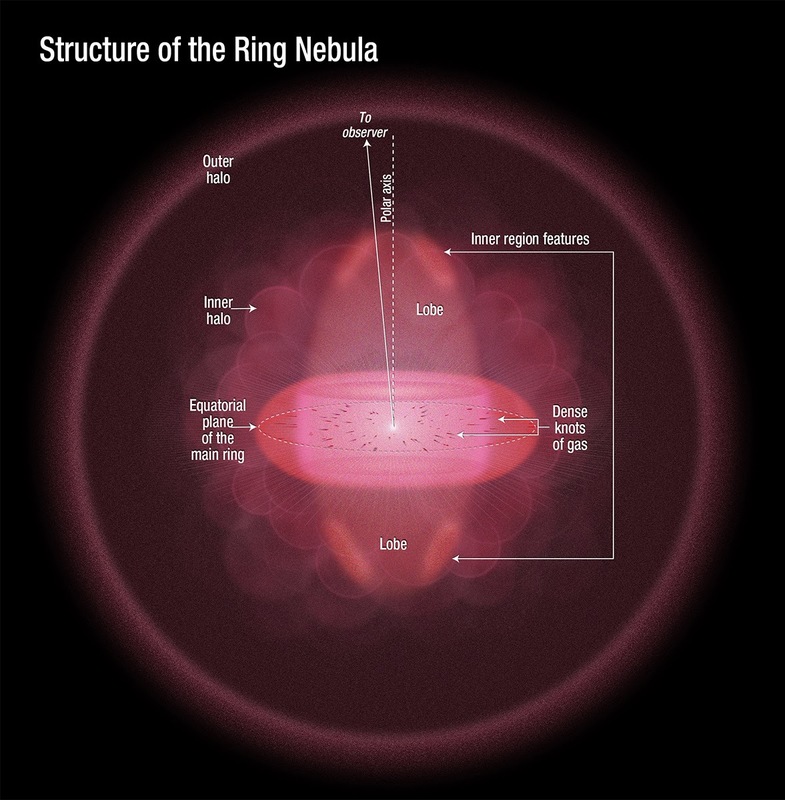 It is the only annular nebular visible through small telescopes, although there are six others now known. ε2, or Fl. 5, Binary, 4.9 and 5.2, both white. These are the celebrated Double Double, each pair probably separately revolving in a period of over two hundred years, and both pairs perhaps revolving around their common centre of gravity; but if so, the period is to be reckoned only by millenniums, for the measures of the last fifty years show no sensible orbital motion. This is by far the finest object of the kind in all the heavens. They are 207ʺ apart, and, to the ordinary eye, form an elongated star; but exceptionally sharp sight will resolve them without aid. The pairs are 3ʺ.2 and 2ʺ.45 apart respectively, and a good 2¼‑inch glass with a power of 140 will separate each pair. The position angle of the components of ε1is 12°; and of those of ε2, 132°; while that of ε1 and ε2 is 173°. Their "double-double" character was first published by the Jesuit father Christian Mayer in 1779, although its discovery has generally been attributed to Sir William Herschel. The distance between ε1 and ε2, small as it is, is nearly twice that noticed by astronomers, in 1846, — 128ʺ — between the actual and the computed positions of the planet Uranus, a discrepancy which convinced them of the existence of a still more remote planet and led to the discovery of Neptune. Such is the marvelous nicety of modern astronomical measurements! Between these stars lie three very much fainter, two of which, of the 13th magnitude, are the Debilissima, Excessively Minute, of Sir John Herschel, discovered by him in 1823.
ε and ζ form an equilateral triangle with Wega, the sides about 2° long; ε being at the northern angle. These three stars were one of the Athāfiyyof the early Arabs. η, a 4.4‑magnitude, is Aladfar in the Century Atlas, by some confusion with the star μ; and with θ, of the same brilliancy, was, in China, Leën Taou, Paths within the Palace Grounds. μ, of the 5th magnitude, was Kazwini's Al Aṭhfār, the Talons (of the Falling Eagle), which he described as a fainter star in front of the bright one,i.e. west of Wega. 1a 1b These are two of the few instances in Arab astronomy where more than one star were utilized to represent an animate object. 2 The English refused to adopt this reform till 1752, when they abandoned the Old Style on the 2d of September, and made the succeeding day September 14th, New Style: a change, however, that "was made under very great opposition, and there were violent riots in consequence in different parts of the country, especially at Bristol, where several persons were killed. The cry of the populace was 'Give us back our fortnight,' for they supposed they had been robbed of eleven days." 3 A full and interesting discussion of this appears in Popular Astronomy for July, 1898.
a I've been unable to find clara Fides or Mercurialis in either the de Lingua Latina or the de Re Rustica, but Varro refers to the constellation as just plain Fides in R. R. II.5.12. The word, by the way, is not to be taken as meaning "faith"; it's the word for a stringed instrument, that has given the English word fiddle: see the article Fidicula in Daremberg & Saglio, and "Nero Fiddled While Rome Burned" (CJ 42:211‑217).